Prohibition agents destroying barrels of alcohol. 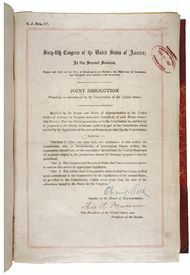 Amendment XVIII (the Eighteenth Amendment) of the United States Constitution, along with the Volstead Act (which defined "intoxicating liquors" excluding those used for religious purposes and sales throughout the U.S.), established Prohibition in the United States. Its ratification was certified on January 16, 1919. It is the only amendment to the Constitution that has been repealed (by the Twenty-first Amendment) (1933). The amendment itself did not ban the actual consumption of alcohol, but made obtaining it legally difficult. When Congress submitted this amendment to the states for ratification, it was the first time that a proposed amendment had a provision that placed a deadline on ratification. The validity of the amendment was challenged on that basis in Dillon v. Gloss; the Supreme Court ruled on the case in 1921, upholding the constitutionality of such deadlines. Because of many Americans' dismay at the emergence of Prohibition, there was a considerable growth in organized crime in the United States in response to public demand for illegal alcohol. Considered a very unpopular law, the amendment was subsequently repealed by the Twenty-First Amendment on December 5, 1933. It remains the only constitutional amendment to be repealed in its entirety. The House of Representatives initially passed the resolution calling for the Amendment on December 17, 1917.The dates of proposal, ratifications and certification come from The Constitution Of The United States Of America Analysis And Interpretation Analysis Of Cases Decided By The Supreme Court Of The United States To June 28, 2008, United States Senate doc. no. 108-17, at 35 n.10. See also It was officially proposed by Congress when the Senate passed the resolution the next day, December 18. Ratification was completed on January 16, 1919, when thirty-six of the forty-eight states then in the Union had ratified it. On January 29, acting Secretary of State Frank L. Polk certified the ratification. The Constitution Of The United States Of America Analysis And Interpretation Analysis Of Cases Decided By The Supreme Court Of The United States To June 28, 2002, United States Senate doc. no. 108-17.